Come on over to the drier, less-crowded side of Oahu where there are still some great Hawaii Activities, and grab some thrills at Wet 'n' Wild Hawaii Water Park the only Hawaiian water park in the entire state of Hawaii! Wet 'n' Wild is conveniently located immediately off the H-1 Highway, in Oahu's second largest city, Kapolei -- just 35 miles from Waikiki. This spectacular Hawaii Attraction offers 25 acres of every kind of swirling, churning, bubbling activity you can imagine, ranging from exciting water slides, swirling rapids, a wave pool so big you can body surf, and even a sedate inner-tubing river! How does a seven-story water slide sound? Wet 'n' Wild has two! If that's too much, there's always the four-and-a-half story model. With plenty of places to eat, rest, play volleyball, watch other people enjoy themselves, and stock up on souvenirs, Wet 'n' Wild is the perfect excursion for the entire family, a place where you'll find all the good, clean fun you can handle. This is an exciting Hawaii fun park. As for theme parks in Hawaii this is the only one of it’s kind. Before you arrive to Hawaii be sure to order a Hawaiian Lei Greetings at the Airport. The park is manned by highly trained water-safety employees, with plenty of park security and medical personnel available at all times. Wet 'n' Wild offers three great packages for you to choose from, all designed to provide a wet-and-wooly experience you're not likely to forget. For more information, check the links on this page. Don't forget to bring along proper swimwear (no thongs, t-backs, or swimwear with metal rivets or plastic), a change of clothes, towel, slippers and some sunblock! Wet 'n' Wild Hawaii Water Park offers several different packages that include the General Admission, Splash Package and the Big Splash Package. 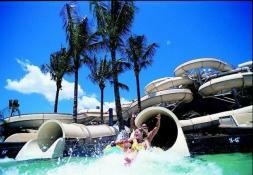 This Hawaiian Water park is fun for the whole family and has many different Hawaiian activities all in one location. For all the different Activities in Hawaii, be sure to check out Hawaii Discount which has everything from Oahu Snorkeling with Captain Bobs near Koko Marina to Oahu Luaus. Some of the more popular luaus in Oahu are Germaine's Luau and Paradise Cove Luau. If you are going to the Big Island of Hawaii be sure to check out the Royal Kona Luau or the Island Breeze Luau, which are both outstanding Kona Luaus. They even offer Hawaii Shark Tours with the only two companies that offer this tour, North Shore Shark Encounters and Hawaii Shark Encounters. Save on these and other Hawaii Tours when you order online here. If you are looking for Costa Rica Tours be sure to check out www.thingstodocostarica.com. So, Are you ready to have some fun? Come on over to the Wet 'n' Wild Hawaii Water Park , which offers plenty of water attractions of all kinds and for all ages. Glide down a seven-story tall waterslide (there are actually two of them in the park), or if this is too much for you, opt for the four-and-a-half-story model. Check out the big wave pool, which is so big you can body surf in it! Or take a leisurely inner-tube ride down the circular river. Kids will love the many spots created just for them, with shallow splash areas, water cannons, waterfalls, and lily pads to jump across and so much more. There are also plenty of places to eat, rest and to stock up on souvenirs. The park is the perfect excursion for the entire family. 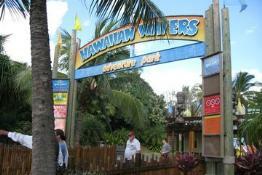 Safety is the park's number one priority as are all the Oahu Tours and attractions offered by Hawaiidiscount.com. Wet 'n' Wild Hawaii Water Park employs highly trained water-safety professionals. There's also plenty of park security and medical personnel available at all times. So you can feel safe and just relax enjoying a great time in the water.